AUG./75 - WHERE DOES THIS DATE COME FROM? THIS DATE IS PROBABLY CORRECT BECAUSE PN 1067 DATED 1911 SHOWS SAME POLE WITH EAGLE HAVING WINGS AND HOUSE NOW HAS TWO WINDOWS. 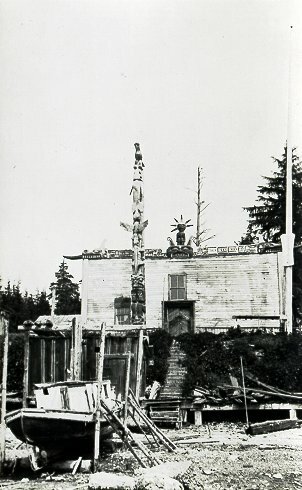 SEE: VANCOUVER PUBLIC ARCHIVES PHOTO In P 104, this is same photograph. SAM CHARLIE'S HOUSE (per. J.Peters, Apr. 19-20/78). MR. DONALD NEW OF GALIANO ISLAND, LOANED US THE ORIGINAL PRINT TO COPY IN 1980. HE STATED THAT HE TOOK THE PHOTO IN 1926.